Want to get totally clear on how to prioritize what you teach, when you teach it and how you teach it? Want to write lessons that have true impact and go beyond “getting through the content”? 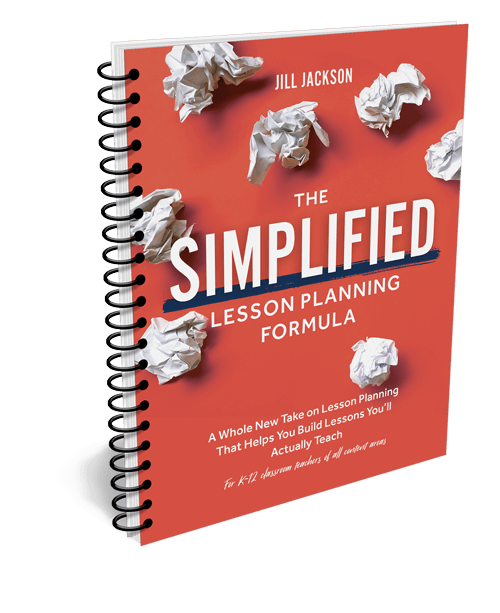 Need to simplify lesson planning so you spend time actually teaching, not searching for umpteen materials online? So why hasn’t it happened for you yet? This isn’t the first time you’ve tried to solve your lesson planning frustrations. You’ve been looking for a way to build lessons that actually bring kids to mastery while incorporating every resource, curriculum map, curriculum and standard you are required to teach. This is a quick story about how I used to spend hours each weekend freaking out over my lesson planning. I was struggling with fitting all my content in and having it actually make sense for me and my students. I was getting more and more frustrated because my lesson plan book was a hodge podge of resources and activities… and if I were being really honest, that lesson plan book didn’t represent what I REALLY taught each day. At the time, I was trying to incorporate every new technique I had learned in professional development, use elements from every program we were required to teach from and link it to the curriculum map that my district had given me. Then the other shoe dropped: We got a new science program and I realized I not only had to learn the new science content, but I had to start lesson planning for that too. All this… and I was ALREADY playing catch-up. As you can imagine, I was in bad shape, but I wasn’t ready to give up on my love of curriculum and planning lessons. I knew that if I could figure out a system for lesson planning, it would actually be one of the parts of being a teacher I liked best! I was really struggling to take the big picture of everything I had to implement every day and break it down into parts that I could actually get my arms around and make my own. I didn’t mind spending the time lesson planning on the weekends and evenings, but I WAS really tired of spending the time and feeling like I wasn’t getting anywhere. So, first I bought more resources because I thought I needed better ideas. Well… that didn’t work at all. I even tried using a computer program that I could put my lesson objectives in and it would shoot out lesson plans for me, but that um… well… that didn’t work AT ALL. Talk about disjointed! Then I tried looking across all of the subjects I had to teach and trying to find what they all had in common, and it worked a little better. And that’s when I finally tried teaching the skills underpinning each subject area as a tool for learning the content in that subject. And guess what? This time it worked a whole lot better. When I figured out that it wasn’t true and that it really didn’t work, I was finally able to break out and get the results I was working so hard for. One real problem is all of the activities available for free or cheap online. TOO MANY OPTIONS were keeping me from discovering how to take a standard or program, break it down into smaller teachable chunks and build powerful, super engaging lessons for my students! So, I realized if I broke each content standard or program down into learnable skills that I taught first, then my students could learn ANY content in ANY content area. It was like giving them the keys to the kingdom of content. I figured that if I taught them the skills for learning the content, they were unstoppable! And out of all of this, I wrote “The Simplified Lesson Planning Formula” book. This took lots of years struggling in my own lesson planning and also visits with thousands of teachers who were struggling under the weight of all they had to teach, just like me! But you know what? It was so worth it because we now have a real-life tool that solves our real lesson planning dilemma! I realized that the Bloom’s Taxonomy 56-step lesson planning routine (OMG!) I had been taught in college not only didn’t work, it wasn’t going to help my students master what they needed to master! Talk about jumping through unnecessary hoops! What used to take me hours each week and at least 4-5 hours each Sunday night, I can now get done so fast because I am planning my whole school year, each month and each week right off the bat. I NEVER ask myself, “What am I supposed to teach next week?” I have already mapped out my entire school year. 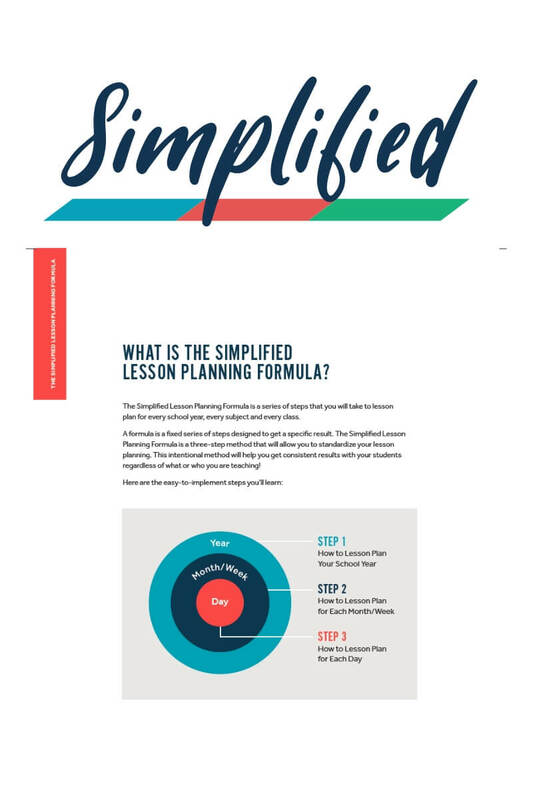 The Simplified Lesson Planning Formula is just that: a combination of steps that takes you from planning your year, planning your month and weeks and then planning each day’s lessons. The book is written as if I am sitting right next to you as you plan… like I get to be your coach on the side! Learn how to take your standards and objectives and lay out what you’ll teach and when you’ll teach it for your whole school year so you can confidently know where you’re headed each month and week and avoid feeling like you have to race through your lessons to “fit it all in” by the end of the school year. Use the Lesson Planning 1-sheets to help you quickly plan your lessons whether you are teaching something new, practicing something already taught, mastering a skill or maintaining what you taught months ago. Get a crash-course in lesson planning so you can feel confident as you choose what you need to teach and what needs to be cut to make room for the most important skills. Discover what instructional clutter inhibits students mastering the most important skills and how you can remove it so you can squeeze the life out of each moment of your teaching time. For less than a week of Starbucks drive-thrus you can get access to everything inside of The Simplified Lesson Planning Formula! If you are ready to plan your school year and feel confident that you are teaching exactly what your students need each month, week and day, then let’s do this! … what life will be like when you know how to take a standard or program, break it down into smaller teachable chunks and build powerful, super engaging lessons for your students! So hit the “I NEED THIS” button below and you’ll be taken to the secure order form where you can adjust the number of copies you want to purchase… many people will buy them for their entire team! After you put in your credit card and shipping information, you’ll see a confirmation page and receive a confirmation email. Our little elves will pull your books from the shelf, package ’em up and send it your way on a nifty little UPS truck!